that fun snack they call “Ants on a Log,” don’t we? You know, the peanut buttery-filled celery stick with raisins on top. that your teachers never heard of? Versions that are only reserved especially for Halloween. All the adjectives a person wants to hear when describing their snack, right? Ener-G pretzel rings, gently cut into 4 pieces each. 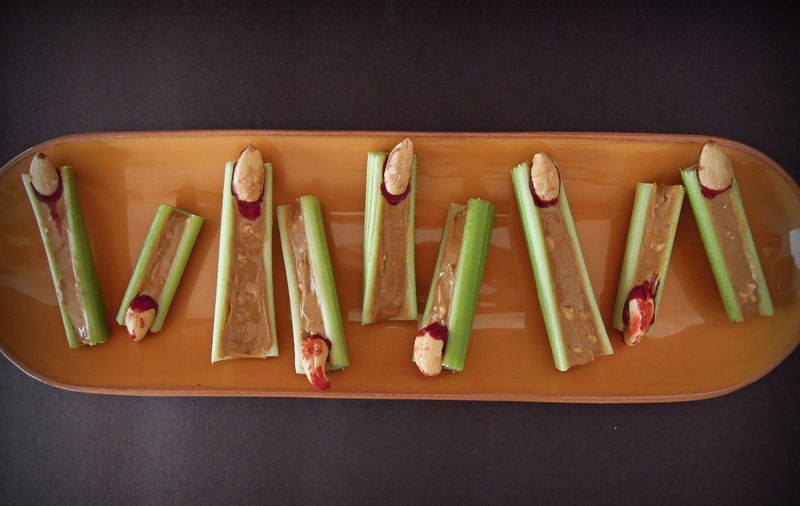 Fill celery sticks with peanut butter. Set aside. Assemble Roaches: place 3 pretzel pieces per side of date (6 total). Place roach on top of celery. of Ants on a Log? Bloody fingers sure hit the spot, don’t they? 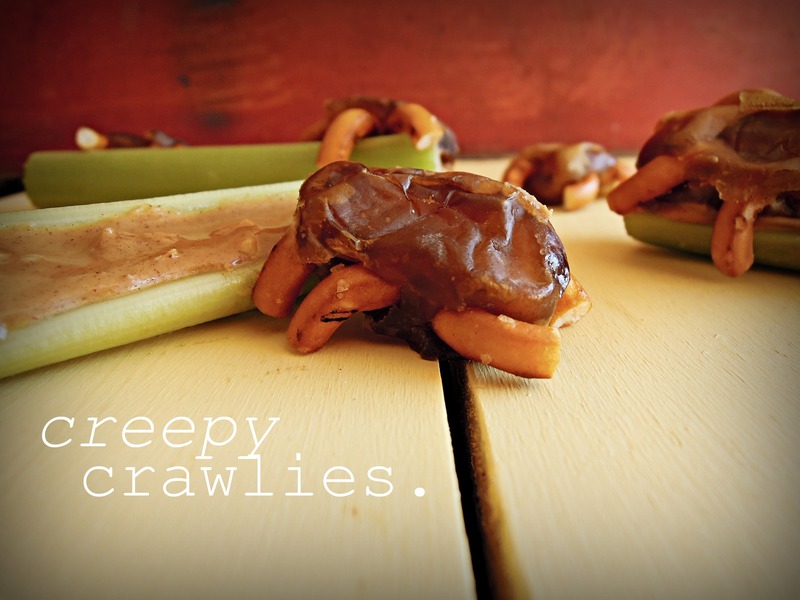 Fill celery sticks with peanut butter. 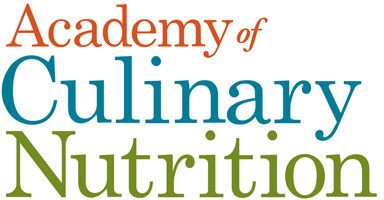 For fingers: Dip wider part of almond into food coloring and place on top of celery. For claws: Dip cashew into food coloring on both sides. Place on top of celery. How many fingers and roaches do you think you can eat? (I’m not really sure if that question actually deserved an evil laugh). Can’t go wrong with peanut butter! These would make a quick and easy party appetizer and snack! I have to bring a Halloween dish tomorrow for a party and this might just be the one! I got nominated for one of those Liebster Awards and there was no way I wouldn’t include you in my list of nominations: http://www.vegangela.com/2011/10/28/im-back-baby/. Thanks again for all the inspiration this month. You rock!! I’m making a grocery list, going through all of your MoFo posts – to get ready for our Halloween festivities this weekend! Fuuuuuuuuuuuunnnnnnnnnnnn!!!!!!!!!! I wanna come–pick me! Pick me! (Too needy?) What are you going to make??? Are these vegan? If so I don’t think I can eat as many as Jeni but maybe five fingers and 1 roach. I love creepiness so much that this post is making me weep. Thank you for another beautiful post. ***no real roaches or fingers were hurt in the production of this photoshoot*** Here’s a tissue GiGi, don’t cry! dare i say our bloody fingers and roaches are cute? especially the roaches, i just want to squish their cute middles. Wow, Emily–a double thanks for that! I am so happy that you like this place 🙂 And thank you for the award…heading over to accept the award! Those roaches crawling all over the logs? Repulsive. I love them. I wonder if you sprikled them with sesame seeds if they’d look like larvae or termites? The finger nails, make me wonder if I could scoop out enough of the end of a carrot (finger shape) to embed an almond slice and then serve them with beet hummus or something. You are too good at this, I can’t wait to see what you’ve cooked up for tomorrow. never thought i’d say this, but what deliciously cute looking roaches! No matter how many times I hear this, I just don’t think I can get used to the idea of cute roaches, you know??? Ew, those roaches. 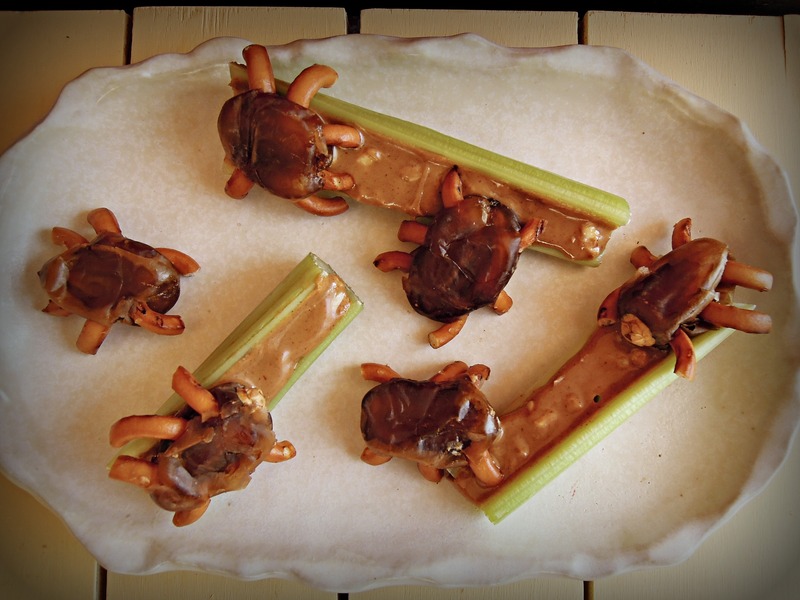 Ew, ew, ew, so buggy looking, and yet… and yet… I still want to eat them. They’re such a good combination of gross/cute/tasty looking! I love them! They are rather repulsive, aren’t they??? hehe. Delightful! Did you just use the term “hork”??? BAHAHAHAHAHAHA!!! Brooke, come back to California. PLEASE!! There you go again, using secret code, leaving this dumb blonde to figure out what it means… Ditzy Hair? Dainty Horn? Drunk Honey? Damaged Hoots? Drastic Honeydew? 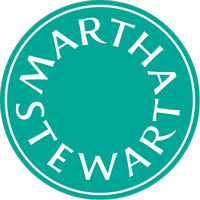 Domestic Hands? Dumb Husband? Any winners? Love! I totally want some roaches on a stick. Oh my gosh, these are AWESOME! haha I love the bloody fingers! I could eat at least 20 roaches. When you told me yesterday what you were making for today’s post I had no idea what to expect. These look amazing! The new camera looks amazing too! aaaaaaah, Thanks “Babs”! bahahaha! At first I had reread your comment–I kept thinking, “Who in the world is this?? !” 🙂 Yes sir, 6am EST it is and the camera is pretty good huh? Love you!